If you experience the frustration of slow sail handling due sails binding, sticking or seizing in their tracks, Smooth Sail 20 is just what’s needed. This is a sail, track and marine fittings lubricator for yachts and dinghies for instantly achieving fast silky smooth sail changes, adjustments and reefing. Smooth Sail reduces the build up of further contamination and is long lasting. The product is safe to use, non greasy and environmentally friendly, containing no toxic or solvent based ingredients. 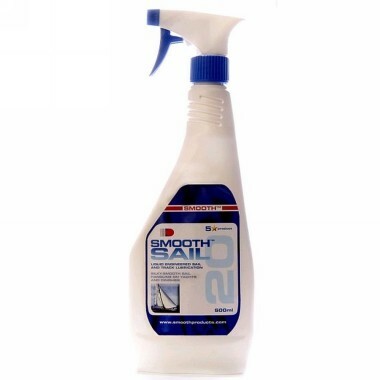 Smooth Sail 20 is applied from a handy 500 ml trigger spray bottle reducing problems of fast evaporation and wind blown spray commonly associated with aerosol applicators. Adjust nozzle to open position and coat sail edges, tracks and grooves. Use trigger to apply liberally.